Adjunct professor Larry Atkins advocates for understanding reliable sources amid a complicated media landscape. 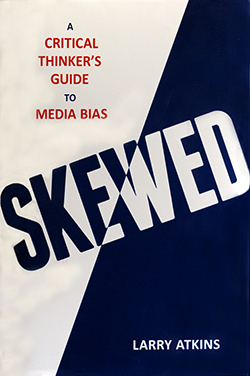 Larry Atkins wrote the book "Skewed" to help the public understand and identify media bias. Larry Atkins began penning his book on media bias many months before the 2016 presidential election, but its August 2016 debut arrived at an important time: The election and its aftermath would breathe new energy into the topic and renew important questions about how people obtain and consume news. Atkins, LAW ’86, a freelance journalist of 25 years and an adjunct professor in the Klein College of Media and Communication, spoke to Temple Now about what inspired the book, Skewed: A Critical Thinker's Guide to Media Bias. What compelled you to write a book about media bias? I have an interest in advocacy journalism, but the topic of media bias has really risen over the last 25 years, especially with advocacy journalism. We would always have class discussions on media bias, and I found that students were interested in it. Many hadn’t been exposed to advocacy journalism, and they found it interesting. I intend it for a general audience. I think it could be used as university textbooks and even high school textbooks, but I wrote it for the general public. I try to use relatively understandable language. I think it’s really something that...could be helpful [for anyone] to read to understand the different types of media and the history of advocacy journalism and how it’s evolved, and how it polarizes our country. I talk about the good and the bad [of advocacy journalism] and then focus on the media literacy part, about how we can be more savvy news consumers. Do you feel your classroom experiences helped you gauge the general public’s baseline knowledge of media literacy? It helps. My friends and peers—I get their perceptions of news and things like that, but it’s good to get the perspective of young people. They’re kind of in a different media universe in terms of social media and where they get news and how much they consume news. It’s good to get that different perspective. Did you find students were getting their news from less-than-traditional outlets? Yes. That’s been especially the case really over the past 12 years. When I first started teaching at Temple in 2004, maybe about half the class might read newspapers or watch television—but now going around the class, almost everybody gets their news primarily from social media. I do find some exceptions, but that seems to be the primary news source. As a journalist and professor, it’s a little disheartening that young people really aren’t reading newspapers, but it’s a changing world. Why do you think the general public might not fully understand the media landscape and how to identify bias? My book focuses heavily on advocacy journalism, which is reporting with an agenda. It’s opinion journalism—you’re not lying or misrepresenting, but you’re cherry picking facts, statistics, expert guests that support your viewpoint. A lot of people confuse that with mainstream news, and really aren’t making that distinction. I have an exercise where I have [my students] watch the nightly news on ABC, NBC and CBS then compare that to Fox News, then compare that to MSNBC, just to get a sense of how different the news presentation is. For a lot of people, it can be confusing. You started this book prior to the election. Do you think the election, the rhetoric surrounding media gives any sense of heightened importance to the topic? Pretty much every day, President Trump has his feud with the media and it seems to serve him well. It’s in the news a lot—almost every week. It’s a shame, because I think journalists are trying to do a good job at being fair and accurate. They’re not “fake news”—that really bothers me, the fact that he has lumped them with the Macedonian teenagers and others who are trying to make money making up stories. Mainstream journalism doesn’t do that. Maybe once in awhile they get stuff wrong, but it’s not as though they’re intentionally creating fake news. I think this last year has been very difficult for journalists [with] the attack they’ve been under. Do you have any opinions on the notion of “mainstream media,” and the perceptions about what that means? I think the reputation of the “liberal elite media” is a little exaggerated. Reporters have their own opinions, biases. The mainstream media is more balanced, centrist, fair than advocacy journalism outlets. I don’t think you can lump the entire media into one aspect; it’s more of a continuum. Some are very clearly liberal. Others are clearly conservative. Then you have a lot that are toward the middle. I think there’s more of a tendency for media outlets to emphasize the controversies, scandals, stories that they think might draw more viewers for ratings, circulation. I think that goes for controversy for both Democrats and Republicans. You touched on the idea of “fake news.” Can you talk more about that and its proliferation on social media? It’s very disturbing that people do get their news on Twitter or Facebook. You shouldn’t rely on your Aunt Judy for news, because Aunt Judy isn’t necessarily making the distinction between reliable sources and unreliable sources. If you’re following reputable news sites like The Washington Post or National Public Radio on your Twitter feed, then I’d say that’s okay, but if you’re just getting it from friends, [they may not] quite know what’s true, what’s accurate, what’s a reliable news source.